My Dinh National stadium, Hanoi. There were no Vleague games scheduled last week due to the international break, where Vietnam would be travelling to Hong Kong. 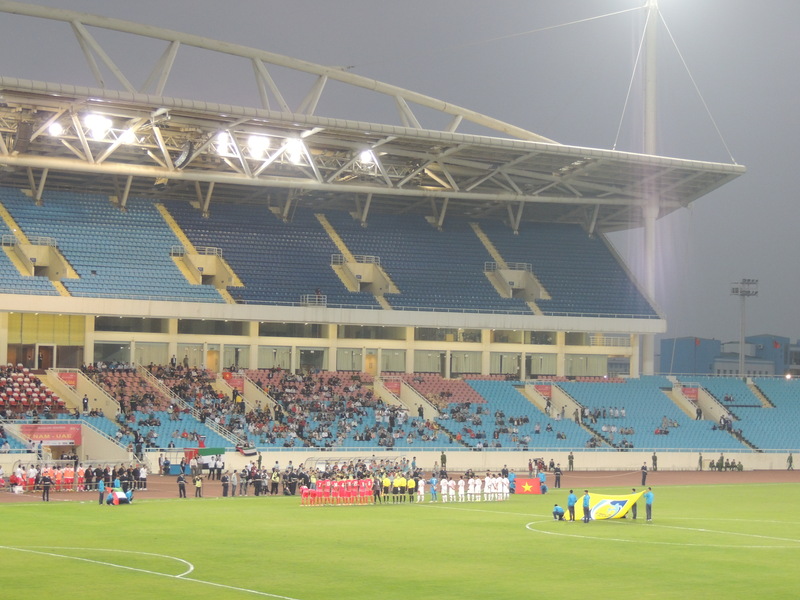 The game was Vietnam’s first away match ingroup E of the 2015 AFC Asian Cup Qualification, where they are also pooled with Uzbekistan and the UAE. The national team entered the qualifying stage on the back a disastrous Suzuki Cup campaign in Thailand. In the opening qualifying game, back in February, Vietnam slipped to a narrow 2-1 defeat at home to the UAE, in what turned out to be quite an entertaining game, where a draw would have certainly been a fair result. Entering the game the national coach mentioned not underestimating their opponents, who are clearly the weakest team in the group, often just a phrase used for politeness when a win is surely the only acceptable result. So Friday came, I was excited, unfortunately not to be travelling to Hong Kong but to find a local bia hoi and take in the game Hanoi style; plenty of cold fresh bia and some delicious food in one of the many bia gardens. Bia started to flow and I opted to move to a bong da (football cafe) thinking would be the best bet for seeing the game amongst a decent atmosphere. I headed to the same place that’s often full with EPL fans taking in a Man City or Chelsea match. On arrival it was deserted. Maybe I’d got the time difference wrong I thought. Surely it couldn’t be that the local fans are really not interested in the national team? This was not possible though, I’d seen plenty of games on in cafes and bars in the past. I asked the proprietor to put the game on; he shrugged his shoulders and said no. Quickly finishing our beers we went to another bong da, one known for showing late night football on a huge screen; again deserted, not a single customer. We managed to get the TV remote and checked all channels; I was beginning to feel rather foolish; had I got the dates wrong? Frantically searching the net on a Smartphone I found the game was indeed taking place, in fact through numerous UK betting sites I could have gambled some money on it. Then with the help of Google translator I found that VTV had in fact refused to pay the $30,000 asking price from the HK Television providers to show the game. It was not to be. Thanks to one of the betting sites (which is odd as gambling is illegal here and one would have assumed this to be blocked online) I found out Vietnam fell to their second defeat, conceding an 87th minute goal to lose 1-0. I was very disappointed not to see the game, but I guess the Vietnamese football fans were even more so. $30,000 doesn’t seem to be a huge price to pay in comparison to other recent media reports of foreign club sides coming to visit in the summer. Negotiations are underway for both Arsenal FC and AS Roma to visit, with one marketing executive quoted saying the Italian teams are much ‘cheaper ‘to get to play in Vietnam than those from the English Premier League. The Italians are only asking for $1,500,000 while English clubs ask for upwards of $2,500,000 to play an exhibition match. $30,000 suddenly seems a very small price to pay to help the game grow here and get interest in local players rather than premier league ‘superstars’.